Social media have become an indispensable part of our everyday life. We use them constantly to screen the latest news and share pre-selected information. The cells in our body do a similar thing. Information is pre-selected and transmitted to the immune system in order to fight against unwelcome invaders, such as viruses, bacteria, parasites or cancer. This pre-selection occurs by means of a highly complex molecular machine. Biochemists at Goethe University Frankfurt and the Max Planck Institute of Biophysics, in cooperation with researchers at Martin Luther University Halle-Wittenberg, have now unveiled the inner workings of this complex molecular machine. Status updates of each cell are transmitted from the cell’s interior to the immune system in the form of small protein fragments. These fragments are presented on the cell surface by specific proteins, known as MHC-I molecules. Cancerous or infected cells can thus be quickly identified and eliminated. However, viruses and tumours can also trick the immune system and in so doing escape immune surveillance. In addition, ambiguous messages can lead to autoimmune diseases or chronic inflammation. That is why it is particularly important to understand how this highly complex molecular machine in the cell’s interior selects the relevant protein fragments and coordinates the loading of MHC-I molecules. In the current issue of the renowned scientific journal NATURE, the researchers from Frankfurt and Halle provide first insights into the molecular architecture and inner workings of what is referred to as the MHC-I peptide-loading complex. “Thanks to groundbreaking advances in cryo-electron microscopy, which were recently awarded the Nobel Prize, we were able to look closely at the MHC-I peptide-loading complex – which is about a hundred thousand times smaller than a pinhead – and to determine its molecular structure,” reports Dr. Arne Möller from the Max Planck Institute of Biophysics. The scientists can now deduce how the cell manages to generate information important for the immune system. 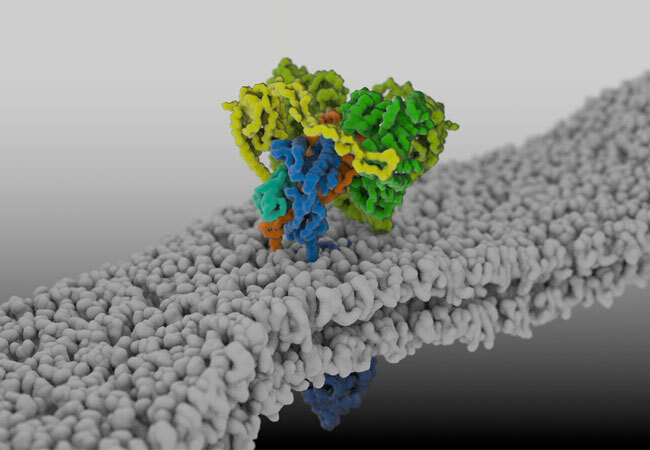 Its structure shows how transport proteins in the membrane, folding enzymes and MHC-I molecules are working together precisely within a highly dynamic complex. “Our research shows how the MHC-I peptide-loading complex filters out only those fragments of information which are actually needed by the immune system’s effector cells. These findings have solved a decades-old puzzle and allow us now to describe the antigen selection process with greater precision. This knowledge will help to further improve immunotherapies,” concludes Professor Robert Tampé from the Institute of Biochemistry.